Koh Phi Phi to Krabi is one of the main routes leaving the Phi Phi Islands. Krabi Province is on the mainland and connects you to the rest of Thailand by bus, boat, and plane. However Krabi is a resort destination in it's own right. The Koh Phi Phi to Krabi route starts you at the modern Phi Phi Don Pier where you hop on the ferry. On leaving Tonsai Bay at Long Beach you say farewell to the views of Phi Phi Ley (home of Maya Bay made famous in the movie 'The Beach’ starring Leonardo Di Caprio)and the mountains of Phi Phi Don. It seems that an anti-climax is inevitable. But as you pass Loh Modee Bay you get a new vista of the Krabi Province coast line full of islands near and far and the broken and craggy skyline of Phrang Nga. When you go from Koh Phi Phi to Krabi you find yourself in one of Thailand's most beautiful and untouched southern provinces. The large mountain ranges of Khao Bencha, long rivers, estuaries, beaches, coral islands, cliff islands and caves, Krabi Province is one of the travel destinations that once visited lives long in ones memories. Krabi Province is an explorers paradise covered with natural forest, rubber and palm plantations. The mountains waterfalls and valleys scenery with the fresh oxygenated jungle compare with the beaches cliffs, in-lets, mangroves forest by the sea. Krabi has it all. 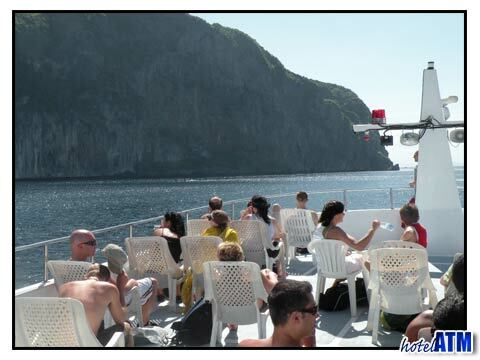 Koh Phi Phi to Krabi ferries take you to 4 main destinations, Krabi Town, Ao Nang Beach, Railay Beach and Koh Lanta. Krabi town is the main town of Krabi Province with all the government offices. It sits on a beautiful mangrove forest. From here you get all the buses to Surat Thani with ferries to Samui and Koh Phangan full moon party. 10 km outside Krabi lies the Krabi International Airport with daily services to Bangkok Hat Yai and frequent routes to Malaysia and Singapore. Krabi town tends to be a stop over location but the 4 star and river front Maritime Park And Spa Resort is great value at USD $ 76 a night. Most people coming from Phi Phi to Krabi to stay take the Phi Phi Ao Nang Ferry to Ao Nang Beach. This is the largest beach resort in Krabi Province full of good value 3 and 4 star resorts. The Krabi Resort has one of the best beachfront locations. Ao Nang is the centre of everything happening in the resort areas and has a good nightlife scene as well. Railay beach was made famous in the 1990s with post Himalayan climbers ‘playing’ (climbing) on the beautiful red limestone walls of Phrang Nga. Initially there were many locally run guesthouses but as the raw beauty of the Railay beaches became more apparent better resorts were built. The iconic Rayavadee Ao-nang now heads up a list of fine beachfront resorts. Klong Muang Beach is the most recent area where a list of fine 4 and 5 star resorts hug the beachfront overlooking the timeless islands of the Phng Nga Bay. These resorts combine tranquillity with some of the best views in Krabi. The Koh Phi Phi to Krabi timetable can be found on the main Phi Phi ferry timetable page though the key depart times are 9.00 am, 10.30, 13.30 pm to the Krabi Town and Koh Lanta and 15.30 pm to Ao Nang Beach. 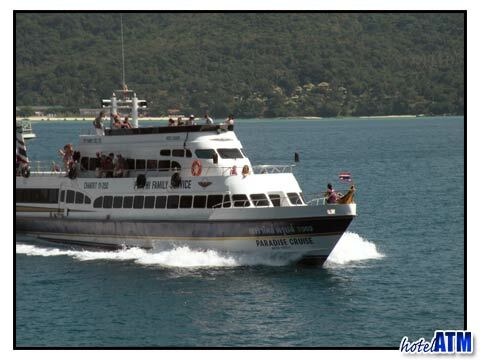 The Koh Phi Phi to Krabi schedule is daily but ferries often stop to Koh Lanta in Low season May till the end of October due to westerly waves. Large ferries run every day to Krabi Town.